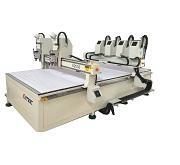 LIMAC MG series multi-gantry CNC Routers perform like several machines working at the same time. Compared to normal machines, Multi-gantry machine has the following benefits. Several gantries share the same machine body and table, which saves investment cost. Several gantries divide one machine into several segments, which transforms one machine into several machines. Multi-gantry machines can be divided into several segments with different table lengths when necessary, which gives customers more flexibility to operate the machine. And the machine design makes it possible that the customer can use the machine in any way that accommodates the actual working spaces and production requirements. In case of necessary, the machine can be transformed into one long-table machine that works with only one gantry, while other gantries stand by at the rear of the machine table. LIMAC broadens its product scope with the growing demands of different customers’ production requirements. LIMAC people welcome customers to come to us, so that we can provide solutions for all different customers’ requirements.